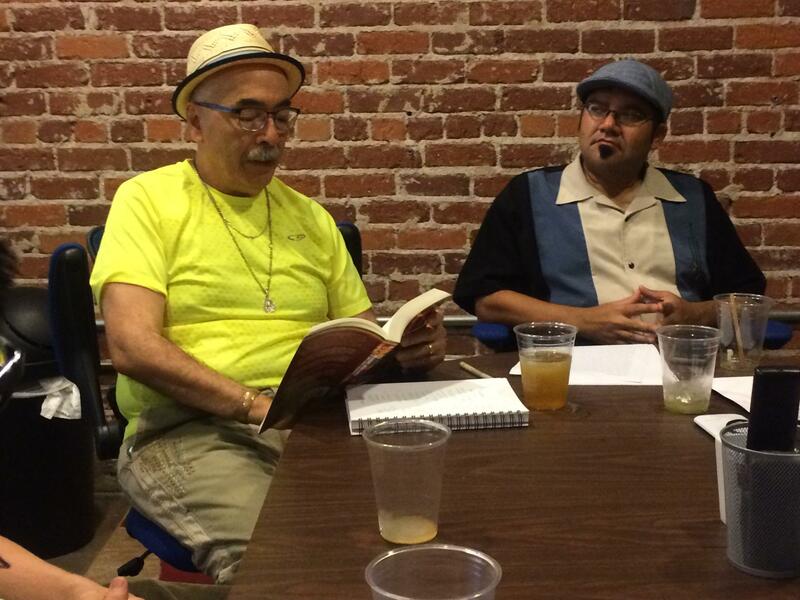 Juan Felipe Herrera reads to a group of Fresno poets. In this interview he sits down with Valley Public Radio Reporter Ezra David Romero to chat about what he's gleaned from his travels and what the next year has in store for him. In September Herrera will become the first US Poet of Latino descent to hold the the office for two years in a row. He says in his first term he came to realize how the Latino community in America looks up to him. At an event in Los Angeles a kid left an impression on him. "I pointed at him and he goes, 'I would like to know how to write a story..." says Herrera. "'I'm writing a story about children left behind when their parents are deported.' He wanted to better write that particular story. So I invited him up to the front of the stage to stand next to me so people could acknowledge him and they all applauded." He also noticed on his travels that many young people are focused on activist poetry. He reflects on an Latino poets workshop in Austin, Texas called Canto Mundo. "One of the poems was read by a young puertorriqueño from New York about Puerto Rico," Herrera says. "It was in the voice of a Puerto Rican working class brother or uncle or grandfather using the Puerto Rican way of talking. Puerto Rican Espanol with a lot of pop to it." He adds, "I was so caught up in the performance and the melodic voice style... I became so aware of how beautiful Puerto Rico is just by listening to his one deep voice. How often have we heard a Puerto Rican, Jíbaro style poem told by a 24-year-old from Puerto Rico living in New York. I think the answer is going to be a small number." With all the shootings and disasters across the nation this year, Herrera says he felt so much pain from the people he interacted with. He wrote a poem about that feeling during the interview. Take a listen below. Your voice that is still flowing. 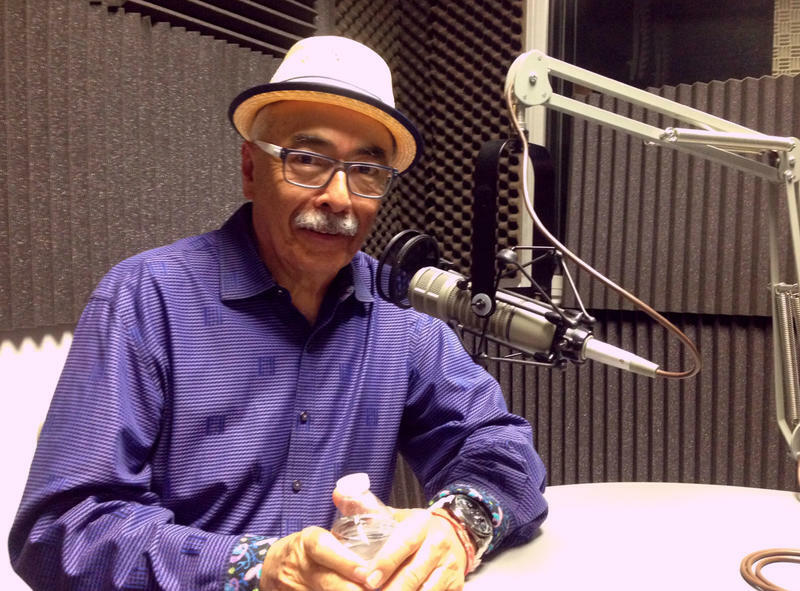 Listen to the poem here and Juan Felipe Herrera's reasoning behind it. Herrera says his second term will focus on kids and a special project in Fresno. "This next year I'm going to have another online project called "The Technicolor Adventures of Catalina Neon," Herrera says. "I hope it will be available in all children's libraries. I am just going to present chapter one, the story of Catalina Neon who has a special power. Chapters two, three, four, five and six are going to be written by children. It's for second and third graders." He also plans to establish a Laureate's Lab where anybody can create poetry. But not just the written word. "We're going to open the Laureate Lab at Fresno State," Herrera says. "It's an experimental poetry-torium. It's a place where you can paint, write on walls and wash it away on walls. It's a place where we're going to unlock the potentials of poetry through unknown experiments yet to be accomplished." He adds, "It'll be a place where you get to mix everything up and see how far poetry can go."